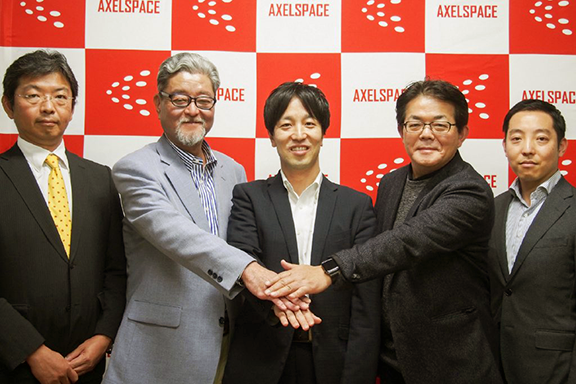 Axelspace Corporation (HQ: Tokyo, Japan; CEO : Yuya Nakamura) has completed their Series B funding round, raising approximately 2.58B JPY ($22.8 million). Photo, Left to right: Mr. Nobuyuki Tanaka (member of the Venture Co-creation Department at Mitsui Fudosan), Mr. Akira Sugawara (General Manager of the same department), Yuya Nakamura (Axelspace CEO), Mr. Yasuhiko Yurimoto (Global Brain CEO) and Mr. Hidetaka Aoki (Partner of Global Brain). The round sees the allocation of new shares to the lead investor 31VENTURES – Global Brain – Growth I Joint Venture (managed by Mitsui Fudosan Co. Ltd. and Global Brain Corporation) and to several other venture capital and corporate investors. With this critical step, Axelspace moves closer to the realization of the new generation Earth Observation (EO) infrastructure AxelGlobe, which will observe the entire planet every day, as was announced in December of 2015. The launch of the GRUS satellite, which had been postponed in 2017, will be performed this month (December, 2018). Moreover, the structure of the organization has undergone some changes in association with the funding event. With the funding obtained in this round, Axelspace will develop two additional GRUS satellites for launch in 2020, which will increase the number of satellites for more frequent captures of Earth imagery. To tap into this valuable new resource, the company is preparing to begin large-scale collaboration with Mitsui Fudosan, also one of the lead investors.